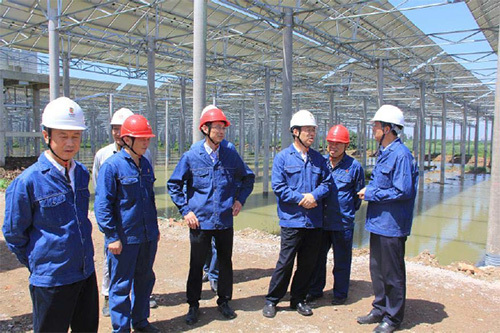 On the morning of 11th July, the Executive Director and President of China Power, Tian Jun, along with other Company's representatives visited the Shijiahu Photovoltaic Power Plant for a site investigation and inspection. Tian Jun thoroughly studied the operation of the centralised control room, control equipment, switch room, host voltage transformer, 110KV step-up station and photovoltaic facility at the site. He also studied the power station's work report on safety production management, centralised monitoring, control and future development, plus the construction of a fishing and light complementary photovoltaic project. Tian Jun particularly highly praised the Shijiahu Photovoltaic Power Station on account of the fact that last year, despite the high risk hazards and high-skill requirements needed for the facility's construction, the power plant was successfully connected to electric power grid in phases. Tian Jun has put forward recommendations for subsequent work. First, he tells workers to pay close attention to the tailing construction and carefully estimating the project's budgeting. Shortly after the completion of the fishing and light complementary photovoltaic project, he adds that it is crucial to contact regional management divisions for inspection and accreditation without delay. Tian Jun also emphasizes strengthening the professional management of the operation, inspection and maintenance team in order to adhere to the motto - "Let's be the leader among our peers, by ensuring quality and refined work." Tian Jun's third focus is on reinforced training. By learning from experience, inviting external experts in for complementary lectures, among other measures, to strengthen operations and training for inspection personnels, plus to improve professional operating capabilities.